Upton Tea has an enormous selection of tea. They certainly understand tea grading and quality. They have 8 pages of Teas from India (including 5 pages devoted just to Darjeelings) and 13 pages of Chinese tea to choose from. If you’re looking for high grade teas with lots of letters this this looks like a great place to shop. However, they must be purists because they don’t offer many flavored teas. In comparison, they only have 1/5 of one page devoted to single flavor black teas such as Cranberry, Wild Cherry and the one I tried – Black Currant. What else, right? The tea has a lovely color, the smell is a tad sweet but the flavor is a somewhat harsh. I should’ve known better. This isn’t what they focus on so I won’t order flavored tea from them anymore but I will order from Upton Teas again. I’ll just stick with the straight classics: Darjeeling, Assam, Oolong and such. 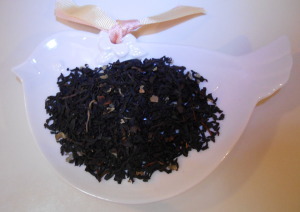 The ingredients listed on the bag are: black tea, blackcurrant, berry leaves, artificial flavor. You clearly see the berry leaves but there aren’t any actual black currants that I could find. You can taste the artificial flavoring. It’s not as strong as some others but you still definitely notice it. Their website is not really user friendly but – the catalog! If you want to read about the history of tea then you’ve got to download their catalog or get on their mailing list. 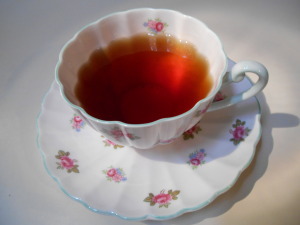 Currently they are on Part 34 of who knows how many parts story called “Reversals of Fortune in the Tea Industry.” It focuses on Thomas Lipton, his involvement in the America’s Cup, and his marketing acumen for his company, Lipton Tea.